Solids, a multifunctional item for desks, combines perfect solid shapes and smooth surfaces and neat grooves, enhanced by the elegant juxtaposition of white and green fine veined marble. 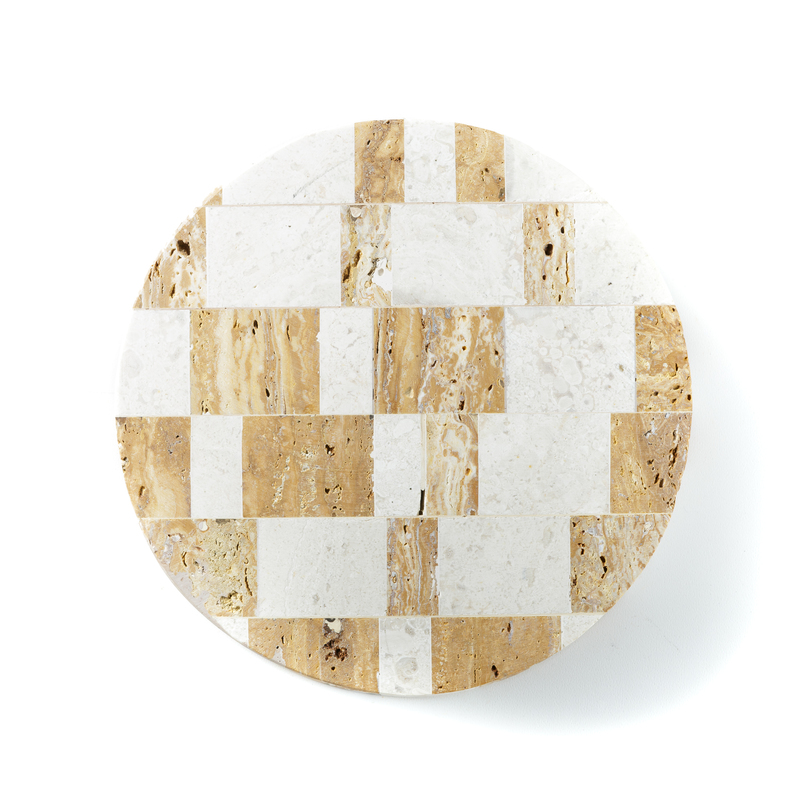 Aneddu, ring, is the new circular wall light, handcrafted according to mosaic work and obtained by combining marble, travertine and Sardinian basalt in fine tonal variations. Trachite, the wall light made from a single block of marble, has essential clear-cut lines and features a fine combination of straight lines and curves. Handcrafted, it comes in two possible LED variants: cold and warm light. 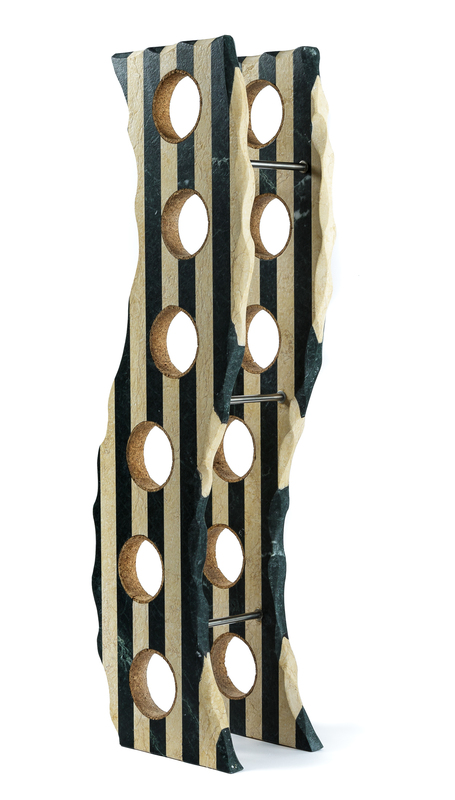 This elegant and exclusive standing bottle holder is called Unna, wave, and pays a tribute to the Sardinian sea with its fine wavy lines. 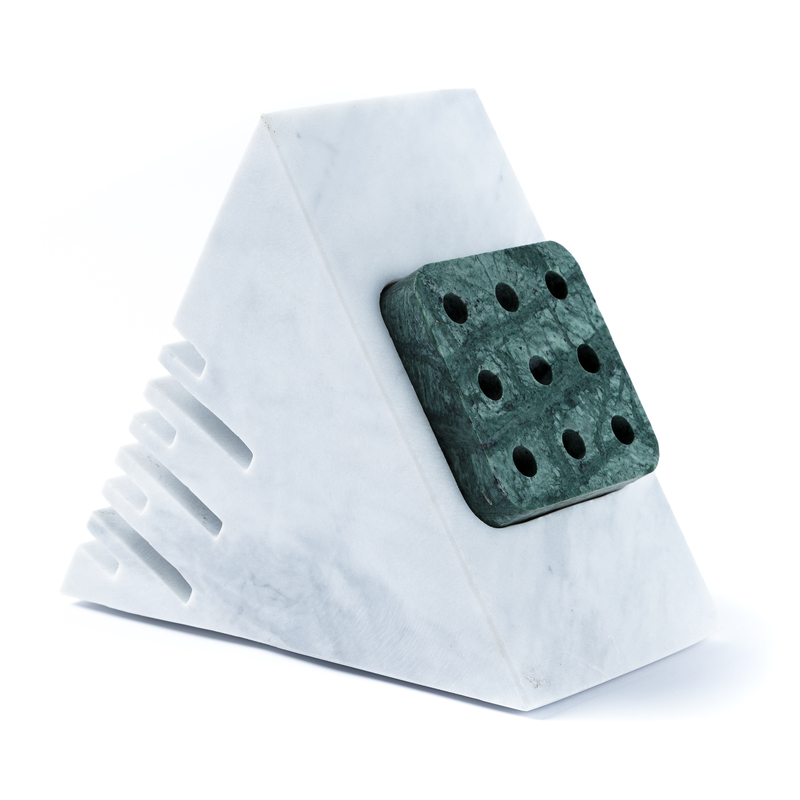 It is made of marble with a wavy effect and it has circular slots, particularly suitable to house a selected collection of the best Sardinian wines. Albino Casu is specialised in stone cutting and has the researcher’s experimental approach towards the creation of a distinctive line of home décor accessories of original shapes and elegant manufacture. In 1999, Albino Casu took over the management of the family business, which had been set up in the 1950s by his father Francesco in Bitti, a village in central Sardinia in the vicinity of important marble and granite quarries. Albino replaced the equipment of the workshop with state-of-the-art technologies thanks to which highly customised stone work can be carried out independently. Over time, building on the expertise acquired, he started devising and experimenting new techniques that exploit the fine beauty of stone as well as its solidity, translating them into functional objects for the home and interior architectures. Products such as tables, wall lights, lamps and other particular home décor accessories are accurately designed and carefully crafted and finished, using quality materials selected for their aesthetic features, colours and grain, in exclusive combinations and contemporary stylised forms. Alongside the well-established building-related business, Albino Casu’s Casu Emmegi realises an exclusive line of home décor accessories, wall lights, tables and lamps that stand out for the innovative and exclusive use of materials, mainly marble and granite, based on an original stylistic design. Equal care is given to the working of marble and granite for home décor, floors, walls, kitchen work-tops, bathrooms, stairs, all highly customised to order. The Emmegi craft workshop combines state-of-the-art stone working technologies, such as the numerical control milling machines, with manual cutting and finishing tools such as manual grinders. Various types of finishing are also carried out: polishing, sandblasting, bush-hammering, brushing and flaming.